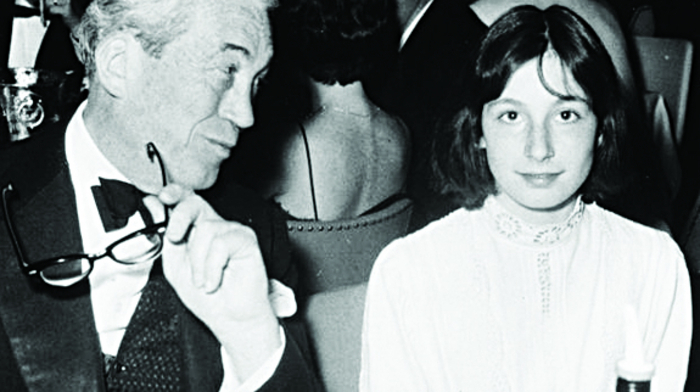 Anjelica with her father John Huston, who had a ‘dramatic air about him’. Anjelica’s father, John Marcellus Huston, a brilliant film director, an inveterate womaniser with an audacious Ernest Hemmingway attitude to life, was soon to make, what appeared to be, an out of character decision. The arrival of a telegram caused a stir in the camp. Huston had not only persuaded Katherine Hepburn, an actress in her prime, to star in the movie, but also Humphrey Bogart, who brought along his famously beautiful wife Lauren Bacall. Anjelica’s mother, the beautiful 19 years old Ricki, heavily pregnant, had stayed behind in Los Angeles with her son Tony, one year older than Anjelica. The decision that Huston made was that these two children would be brought up away from the Hollywood life style. In fact it was a decision that suited him too. Then in his mid forties, Huston was a legend in Hollywood, not only for his great films, but for his swagger, intelligent companionship, wisdom and humour. He was a wonderful host, with entertaining stories to tell, crying out for an audience. He came from a long line of interesting forebears. His mother’s grandfather, William Richardson, was a Civil War hero, who lost an arm at Chancellorsville; while a much talked about family relative, John Gore, was a cowboy, a saloon owner, a judge and professional gambler, and a confirmed alcoholic who, during one crazy night, actually won the town of Nevada in a sensational poker game. When Huston moved Ricki, and his two young children into St Clerans, a Georgian classic home on a 110 acre estate at Craughwell, Co Galway, he could live the life of a country squire that he had probably hankered after. As well as giving his children a wonderful opportunity to enjoy a care free childhood, he acted as a host to many of the Hollywood greats who called regularly. These included Marlon Brando, Peter O’Toole, and Burgess Meredith; and writers John Steinbeck and Carson McCullers among others. They delighted in Huston’s company. They had a choice of horses from a fine stable, enjoyed formal candlelit dinners (usually a Limerick ham was in evidence ), and they went on wild car journeys into Connemara returning to Paddy Burke’s in Clarenbridge, for oysters, Guinness and singsongs. Despite the carefree existence at St Clerans, and later school with the Mercy Sisters at Loughrea (on her first day Anjelica sang La Marsellaise to the rather startled nuns ), Huston had already moved on from Ricky. St Clerans was in fact two buildings: The Little House (formerly the steward’s house ), beside the stables, was where Ricky, Tony, Anjelica and a nurse lived; while the Big House, renovated by Michael Scott, was filled with Huston’s treasures which he had accrued during his travels. When Huston was home he would stay in the Big House. The children would be thrilled to be invited for breakfast, where they would often meet a new mistress (even if they didn’t make the connection at the time ), who was always kind, and who made friends with them. Anjelica was too young to appreciate why her mother,‘ a stubborn victim of Dad’s rejection’ could look so sad. In the first instalment of her autobiography, A Story Lately Told, Anjelica sensitively tells of her very privileged childhood, living in a very adult world with all its glamour, fabulous holidays, and exotic hotels. Despite her father’s best hopes for a carefree childhood, she was a vunerable child, teenager and a young woman, trying, like all others, to find her own path; and to understand‘ the mysteries’ of her family’s relationships. Once when Anjelica ran to meet her father for breakfast in the Big House she was greeted by Rin Kaga, a samurai warrior in full costume coming down the stairs. Huston had just returned from Japan after making The Barbarian and the Geisha, and brought one of the actors back with him. To her surprise the samurai was weeping with happiness to be at St Clerans. Huston explained at breakfast that his tears were a great compliment, as samurai were only permitted to cry a few times in their lives. Poor Anjelica, who admits to have cried an average three or four times a day, was mystified. The Galway ladies who ride. NOTES: * Anjelica was to become the third generation of her family to win a Academy Award, for her performance in 1985’s Prizzi’s Honour.